(Pig Exploitation - Slaughter - 02) This is another look at the holding pen at the slaughterhouse. 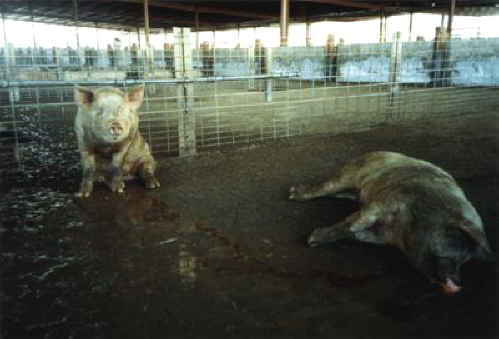 Left behind is a dead pig (right) and a "downer" pig who is too sick to walk. Typically the downer pig would be left to die if they couldn't get it to walk to his or her slaughter. When a business is based on killing, there can be no compassion or mourning. Won't you please mourn for them and the millions of other animals who suffer and die each day? If your sorrow is true, you'll stop eating them, too.